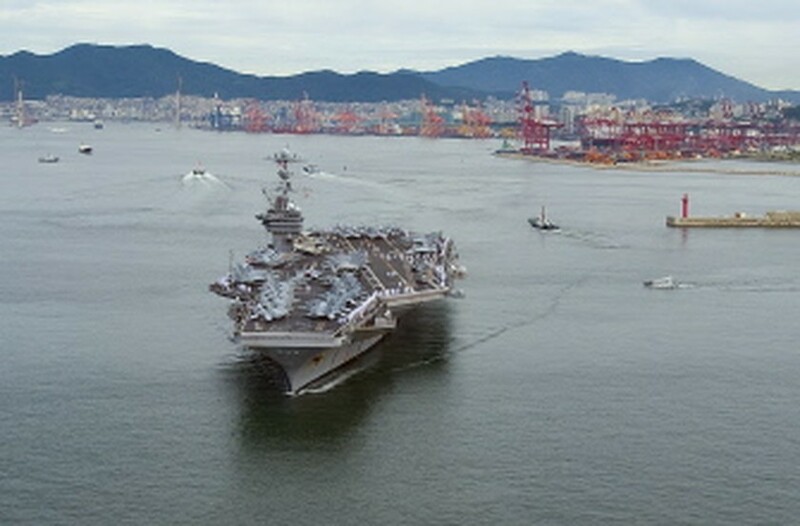 SEOUL, July 26, 2010 (AFP) - South Korea and the United States plan to stage anti-submarine drills Monday on the second day of a major naval exercise aimed at deterring North Korea, an official said. About 20 ships including a US aircraft carrier, 200 aircraft and 8,000 military personnel launched the four-day drill Sunday as a warning to the North following the sinking of a South Korean warship. The North, which denies US and South Korean claims that one of its submarines torpedoed the corvette, has threatened nuclear retaliation for the drill which it claims is a pretext for aggression. "Today's drill focuses on detecting and destroying enemy submarines in a simulated naval battle," a spokesman for Seoul's Joint Chiefs of Staff told AFP. "In the afternoon, fighter jets will conduct live-fire exercises." The exercise is being held in international waters in the Sea of Japan, south of North Korean waters. The North's powerful National Defence Commission warned Saturday it would "start a retaliatory sacred war" of its own style at "any time necessary" to counter the drills which it said aimed to incite war. It said the country's army and people "will legitimately counter with their powerful nuclear deterrence the largest-ever nuclear war exercises to be staged by the US and the South Korean puppet forces". Seoul and Washington, citing the findings of a multinational investigation, accuse Pyongyang of attacking the warship near the tense Yellow Sea border in March with the loss of 46 lives. In addition to the current exercise, the first in a series, the United States last week announced new sanctions to punish the North for the sinking and push it to scrap its nuclear weapons programme. In response to Beijing's protests, the current exercise was switched from the Yellow Sea separating China and Korea to the other side of the peninsula. But officials said future drills would be held in the Yellow Sea. China called for restraint from all sides. "All involved parties should commit to providing peace and security on the Korean peninsula," Foreign Minister Yang Jiechi said Sunday in Vienna.